January is the time when people are making new goals for the year, decluttering their homes, and implementing new systems to set themselves up for success in the new year. Last year I spent the better part of the year evaluating current systems that we had in place in our house, identifying pain points, and setting up new systems to alleviate said pain points. One of the biggest pain points in our house at the time was getting the kids ready for school each morning. For starters, they couldn’t reach their own clothes because all they had in their closets was one single rack that was two feet too high. This resulted in Brian and me having to get their clothes down for them every single morning, and since we were already in their rooms helping them get their clothes down, they also expected us to help them get dressed. This meant that we were constantly hovering over them and wasting precious time when we could have been getting ourselves ready instead. 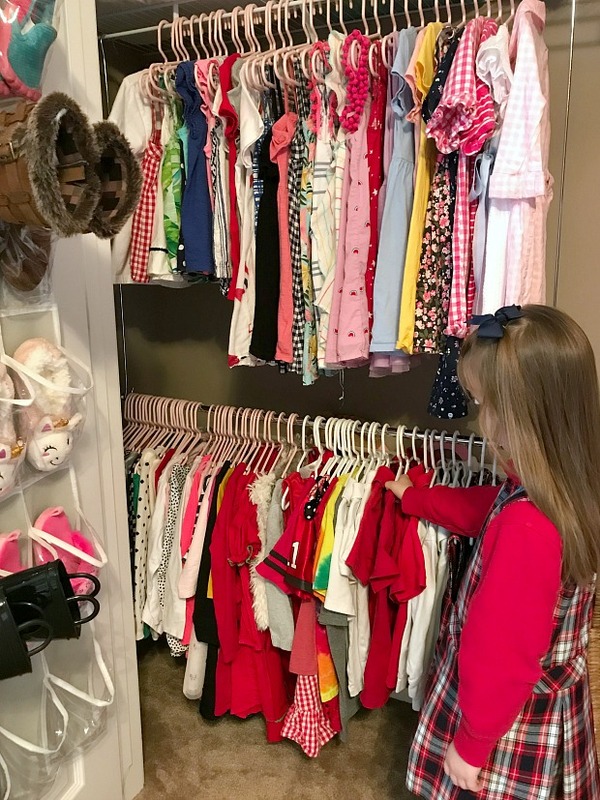 Since we worked a lot on independence last year with the kids, I knew we needed to give them the tools they needed to help achieve this, and since it was impossible for them to reach their own clothes, something needed to be done. I first looked into custom shelving, but unfortunately closet customization is incredibly expensive plus it requires a whole ordeal to have everything installed. Since closet customization was out of the question I decided that something simple would be more beneficial to us, so I set out to see what I could find. It’s a closet extender, y’all! How did I never even know that these existed until last year?? At just $9.99 apiece they are incredibly affordable, and they are even easier to install. 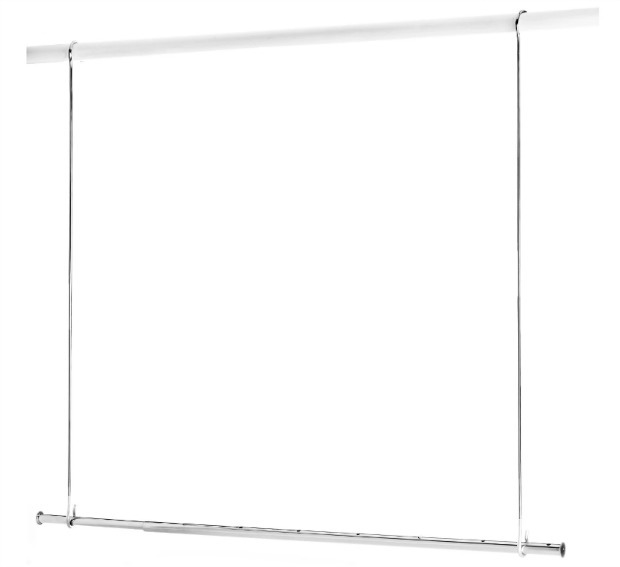 All you have to do is attach the bars with the hooks to the rod, and just hang the whole thing in your closet. It literally takes about 30 seconds. And all in about 30 seconds for just $10!!!! We have been using these in both kids’ closets for nearly a year now and I cannot even tell you what a game changer it has been. We now store clothes for the current season on the bottom rack so they are within arm’s reach for the kids, and the clothes for the off season are hung on the top rack since the kids won’t need them. When the new season rolls around, I just move the clothes from the previous season to the top rack, and move the clothes for the current season to the bottom. Easy peasy. The length of the extender is adjustable, so you can use it in pretty much any size closet. It starts at just 33 inches for the smaller closets and expands all the way to 56 inches for larger closets, so you can customize your closet however you wish. We have this exact extender here, but there are also some other options on Amazon here if you’re looking for something different. I hate to sound like an infomercial, but these things have been so life-changing that they are just too good not to share. 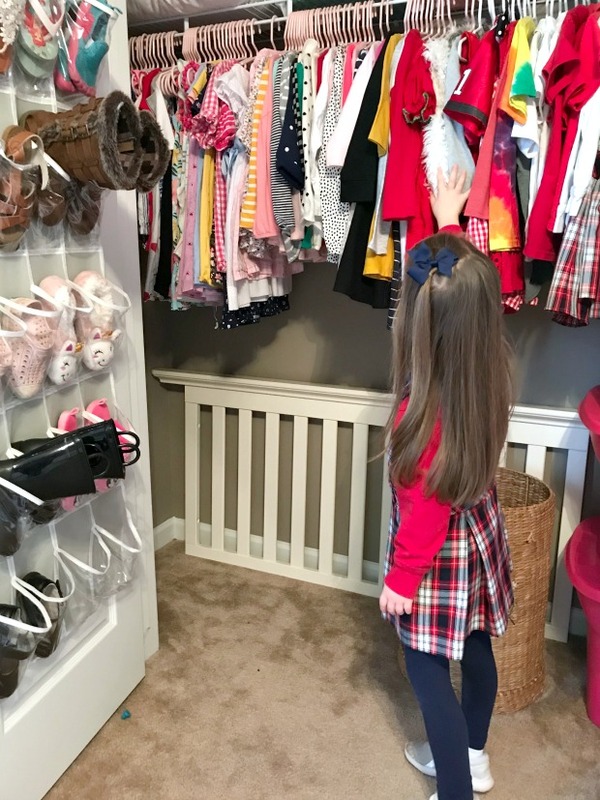 If you’re having similar issues with your kids, or if you just want more space in your closet without breaking the bank, you should definitely check them out! What a great idea! Your graphic for pinterest is also really good! Ditto to what Tanya said! Aw, thank you ladies!! Y'all are the best! I feel like this is one of those - why did I think of that - ideas! So simple, and so useful! That's a wonderful way to double your space! We have shelving systems installed in our closets but honestly; with three boys they never use their closets for much of anything and I've been thinking of adding shelves or drawers instead of a rod. I would love to eventually have shelves or drawers in there... that's the dream! Since hubs and I aren't handy with woodwork, we'll have to pay for some kind of system to go in there. I dread finding out how much that would cost! I'm glad that's worked out so well for y'all! This is genius! I might need this!! Brilliant! I put the off season clothing away in bins but this is awesome. I also noticed the hanging shoe organizer you have and I am thinking we need this so badly. Now with three of us girls, the shoe situation is getting out of control. That's what we used to have to do, too, but in our current house we can typically leave them out all year round. But yes, I bet your shoe situation is out of control with three girls! Haha. Thanks for stopping by! Such a smart and quick fix. We have redone all of our closets to maximize space and utilize the space to its best potential. There was so much wasted space before and especially now that the girls share, we needed to squeeze all of the space their closet had to give. Yes! Yes! Yes! Your story sounds EXACTLY like ours. I ended up getting two of these last year and they've been nothing but magical!!! The entire process of getting ready in the morning has changed! I need one for the nursery, so I'll be grabbing another one - I'll have to use your link. ;) Thanks for posting. Even though I have some already I had forgotten about the baby's closet! I grew up with a rack like that in my closet and have it hanging in Gabbie's closet now. Actually, Simon could really use one too! I loved this thing when i was in college and right after when you lived in apartments and had crappy closets. This is genius! I have never known this existed and want to own one! Thanks for sharing! Oh gosh this is fabulous!! So flippin cool! Great price and looks fabulous. What a great solution! My closet already has two racks but if it didn't I would be getting this asap! Great graphic! And if Sadie couldn't reach her clothes this would be such a great solution! That is awesome. I wish I had one of those when my kids were little. Glad you found a great (and inexpensive) solution! My husband's grandfather custom built our house, and since they had kids, he designed the closets in the extra bedrooms with them in mind. All of the rods are positioned lower in the closets with storage shelves above! That is sooo cool and for only $10?! I need this for my girls room. That is really a great way to add extra space to a closet. Thanks for sharing at Cooking and Crafting with J&J.